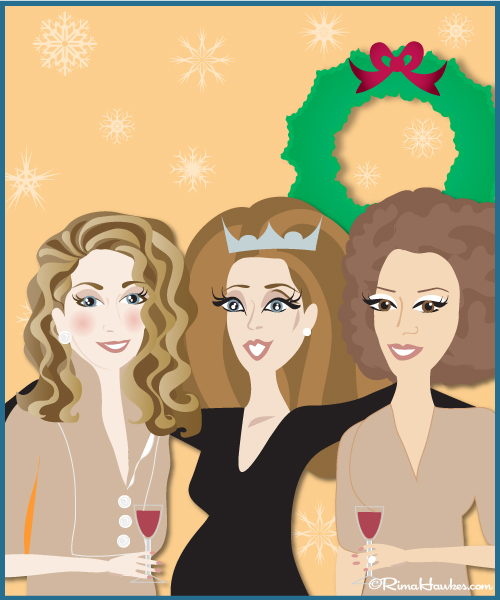 It’s the holiday season and life looks different, parties included, now that you are pregnant. It’s not just the mocktails instead of cocktails, or the favorite foods you now have to avoid (sushi, carpaccio, and delightful French cheeses). You may feel unsure of yourself or your changing body. Every day seems to be an adventure in transformation. In addition to nausea and fatigue, you are on the emotional-hormonal rollercoaster ride of a lifetime, which can make you fierce, weepy, euphoric and amnesiatic all at the same time. With so much going on, you may not feel like being the life of the party or even going to one. You may prefer to fantasize you are Mrs. Claus hibernating at the North Pole, armed with platefuls of cookies and pitchers of virgin eggnog. As cozy as this might sound, especially if you are fatigued, it’s a better choice to have some fun with friends. ‘Tis the season to remember that friends are good for your health. Socializing can boost your energy and mood. You’ll have plenty of time once the baby is born to stay at home. So go out and show ‘em what you’ve got! 1) Let Positivity Reign: Psyching yourself up for a holiday party starts in the mirror. Stop focusing on nagging imperfections and see the new you. Pregnancy is a time when a woman comes into her own. Say it with me: I’m beautiful! 2) Embrace Your Curves: Some women can’t wait to show off their bumps, and they manage to find outfit after outfit that looks simply stunning. But if you’re not Heidi Klum, you may be a little more reluctant to venture out into the holiday social swirl, and you may wonder whether to play up or camouflage your pregnancy. My recommendation: show off your beautiful bump! Find a few holiday outfits that tastefully flatter your new body and have fun with the new, more voluptuous you. 3) Try Something New: Spice up your look with a colorful pashmina or costume jewelry. Try something bold: a statement ring, a pop of color or something you have always wanted to try but never dared. Branching out from the basics - which, let’s face it, can get really boring, really quickly- will enhance your look and your mood. 4) Prep Yourself! Even in your pre-pregnancy days, getting ready for a social event took a little work. Now, you have a great excuse to take pampering even further. Getting your mind and body (and hair and lips and eyes and nails) ready to socialize is well worth your time because they’ll help you to feel comfortable and confident. If you could do anything without any personal consequences, what would it be? If you were reincarnated and could come back as anyone or anything, what would it be? As you psyche yourself up for the holiday season, remember that everyone loves a pregnant woman. If you dread socializing, let others do the talking. Just listening to them makes most people think you are brilliant, interesting and a great person! Chances are you’ll have a better time than expected while you’re expecting. Wishing you (and your bump) a beautiful holiday party season!